Over the past couple of days I tore up my fingertips some more carefully putting down more faux ballast in a way that supports the track on a completely flat (tiled) surface while providing studded texture all around. It also helps keep everything from sliding around much whilst still allowing a bit of flexibility to account for table edges being bumped & such. Then I added this diesel shed/motive power depot/maintenance shop/whatever it's called in your local region or on the specific train-related sites you frequent :) I realized while filming this that I had wanted this specific type of model building since I was quite young and first learned about HO scale trains. Life goal achieved! 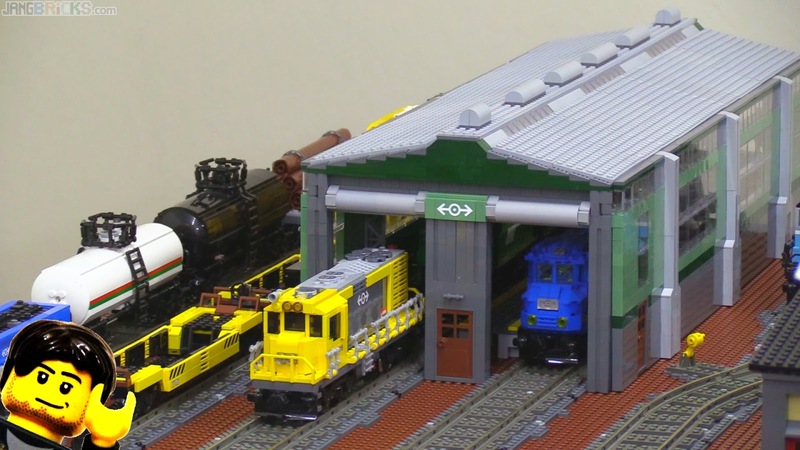 Video: Custom LEGO train engine shed / shop / depot in the city! Ha ha! I have very fond memories of when my dad and I added a locomotive shed to my old Hornsby 00 train set. Really makes the whole thing suddenly feel a lot more alive and functional. Lovely little building and compliments your rolling stock nicely. Great build. Think you need to add a train wash! Not seen one of those in anyone's LEGO City builds yet. Might have to try that myself actually. And you have an enviable spare parts bin to be able to knock something like that out without acquiring parts. came out awesome considering you used present inventory! Keep the videos comin!